If you’re building apps in an enterprise environment, you’ve probably experienced the growing divide between the number of mobile use cases identified for development, and the capacity of the development team to deliver. Some teams have as many as 50-60 apps waiting for development. Of course, a big selling point of Ionic is that we help you build apps faster: Write once, run anywhere, using common web languages that you already know and love. But, we know there’s more to it than that. No matter how skilled you might be, it can still feel like you spend half your time paging back and forth between your code editor and the developer docs, asking yourself: Which component should I use? What’s the right syntax? Where does that header go? And so on… Not to mention stuff like managing plugins or figuring out how to integrate with a new backend service. Well, I’m happy to announce that the team at Ionic has just introduced a new solution, Ionic Studio, designed to take all that extra stuff off your plate so you tackle your app backlog while we take care of the rest. Ionic Studio is a full-featured, locally-installed IDE that provides an unparalleled developer experience for anyone building apps with Ionic. Based on the same open source project that VS Code is built on, Studio has all the features you’d expect from a robust code editor, such as TypeScript support, autocompletion, debugging and more. But it’s all the extras we built with the developer in mind that we hope you’ll really appreciate. For one thing, Studio may just eliminate the need for developer docs altogether. As much as we take pride in having well-written docs, we know it can be a pain to page back and forth between a code editor and a docs page. With Studio, everything you need to know about Ionic is right there in the IDE. The complete library of 100+ Ionic Framework components, which are frequently updated, can be easily browsed simply by scrolling through the list. It’s as easy as selecting a component to drag and drop it into your app, which will then automatically generate the essential code you need. Plus, you can navigate all of your property settings in the pane on the right. Additionally, Studio helps you visualize your app as you’re building it by allowing you to preview your app on any installed simulators, in a web browser, or on a native device. Live Reload automatically refreshes the UI as you make changes in your project so it’s always up-to-date. Also, Studio includes a visual design mode that allows you to easily switch back and forth between code mode and design mode at any time in order to ensure any changes you make are reflected in the code. Even with all of those features, we see Studio as much more than just a code editor. It helps you manage your entire development project. This includes your Cordova plugins and platforms, the colors and themes of your app, local assets and files, and a whole lot more—Making it easy to organize and manage everything you need to build high-quality apps, quickly—all in one place. And, if you didn’t think the above was enough, Studio helps you build full-stack apps by integrating directly with backend systems and third-party services. In partnership with Amazon Web Services, we announced the first backend integration available in Studio: AWS Amplify, a library of highly scalable, reliable, and flexible cloud services for mobile and web apps. In fact, I was on-stage at the AWS re:invent show today, unveiling Ionic Studio to a packed audience and demonstrating the AWS integrations featured in the solution. By offering services like AWS Amplify from within Studio, we hope to make it much easier for front-end developers to integrate backend and third-party services, all from a single development environment. To add these services to your app, just drag the associated components into your code files and voilà! Of course, just accelerating the development process is not enough. Equally important to us is how quickly you can get working code in the hands of your users. That’s why Ionic Studio will integrate with Ionic Appflow (formerly Ionic Pro), a mobile DevOps suite of services to automate every phase of your app delivery pipeline—from building native binaries to real-time app updates—so you can ship changes at the speed of development. In fact, while more than 50 percent* of enterprises ship code four times a year or less, Ionic Appflow users are shipping 3-4 times per month on average, and in many cases weekly or daily. Ultimately, we want everyone to benefit from Ionic Studio. We’re currently working on a Community Edition that we hope to roll out later in 2019 to allow individual developers, students, and others to supercharge their development. For now though, we recommend Ionic Studio for professional development teams looking to undertake mission-critical app development projects or a growing backlog of apps needed to support the business. In fact, we already have a few enterprise development teams building with it and we can’t wait to see what you all are able to create too. And with that, we’re happy to say that Ionic Studio is available today. If you’re interested in starting a project in Studio, please reach out to us for a live demo or custom quote. Some of you might be asking, what about Creator? While Creator has a similar look and feel to Studio’s visual design mode, in reality the tools are quite different. 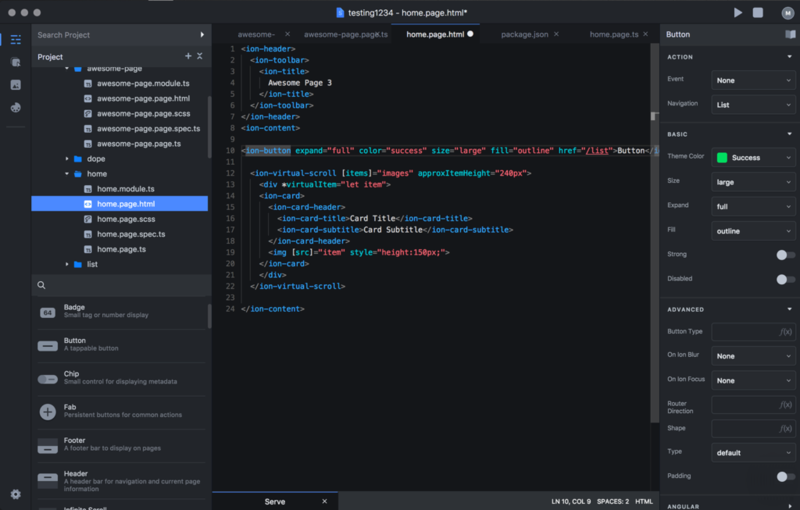 Ionic Studio is a locally-installed, full-featured IDE for professional developers. Ionic Creator is a cloud-based app builder for people who are new to development or who are building more basic apps with few customizations. We know that people love Creator, so it will be staying around for the foreseeable future. Once there is a Community Edition of Studio, we will evaluate the feature differences and determine next steps.